There are two weeks left this season to use this cat. This week, the Tampa Bay Buccaneers are at home against the Carolina Panthers who are 2nd to last in passing touchdowns given up this season. The Panthers also rank in the bottom 10 in yards given up through the air. Jameis looked like a much better quarterback against a sub par passing 49ers passing defense proving that Jameis is capable of taking advantage of a favorable match up. The last time that the Buccaneers played the Panthers, Ryan Fitzpatrick threw four touchdown passes. Cam Newton and the rest of this offense is going to run up points while trying to get their season back on track so look forward to Jameis playing catch up all afternoon. Hopefully it doesn’t come to this for most of our readers, but if it does, Keenum isn’t the worst option in the league this week. In fact, Keenum has been playing a lot better as of late scoring 15 fantasy points in 3 of the past 4 weeks. Keenum hasn’t thrown an interception in three weeks and Denver is clawing their way back into the playoff conversation in the AFC. Denver’s opponent this week is Cincinnati. Cincinnati has also given up 25 touchdowns through the air this season including 4 to Baker Mayfield last Sunday. With A.J. Green back this week to help out Driskel, Denver might actually have to put up a few touchdowns to keep up. The Falcons are at home this week, but as they say, defense travels. 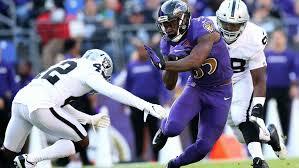 The Ravens have only given up 15 passing touchdowns this season and rank 2nd in yards given up through the air. The last time that the Falcons faced a decent Dallas defense a couple of weeks ago, Matt Ryan only scored 13 fantasy points. I don’t think Matt Ryan will be a bust, he’s usually good for at least 250 passing yards, but I think there are better upside plays available. He just became relevant yesterday and now it’s time to put him into your lineup and you can look forward to possible RB1 numbers. Kareem Hunt is a very good running back, but the system that he played in was more important than his talent. Also, don’t forget how good Spencer Ware was in 2016. Before his injury in the 2017 preseason, Ware was going very high in fantasy drafts. Kansas City faces Oakland this week. There is a good opportunity for multiple touchdowns and a lot of yards. Alex Collins has been placed on the season-ending IR list. Gus Edwards’ main competition for rushing yards will now be Lamar Jackson. Gus the Bus has back-to-back weeks with 100 yards on the ground and it just so happens that the Falcons give up 5.1 yards per carry. Gus Edwards put in a full practice on Friday so injury shouldn’t be a concern. Peterson actually started to look his age in the month of November. In 3 out of the last 4 games, Peterson has scored single digit fantasy points. In the one game that he scored double digit points in November, he had two short yardage opportunities that he punched in. It’s not something that I think that you can count on against Philadelphia. While Philly does give up 4.9 yards per carry, they rank 11th in rushing yards given up per game. Washington may have to count on Chris Thompson in the passing game to keep up with Philadelphia on the scoreboard. Refer to the Jameis Winston part of this post for the stats about the Panthers passing defense. DeSean Jackson is sitting this game out with a thumb injury. The last time that the Buccaneers played the Panthers, James Bradberry kept Mike Evans extremely quiet in their match up, If history repeats itself, both Humphries and Godwin could be in for a big day. Despite Denver getting home to the quarterback and forcing turnovers more often than they did earlier in the season, they do give up their fair share of yards through the air. I mentioned earlier that A.J. Green is back this week and that helps Boyd out a lot. Cincinnati doesn’t have a lot of weapons so when A.J. Green is out of the lineup, the secondary throws their best game plan at Boyd. Things weren’t going well for Boyd in the first half last week when Dalton was in at quarterback, but Driskel was able to connect with Boyd for a touchdown in the second half. Larry Fitzgerald has scored five touchdowns in the Cardinal’s last 5 games which could possibly give him a solid floor this week against the Packers. The problem is, Larry Fitzgerald has just four catches in the past two weeks. Josh Rosen’s favorite wide receiver in this offense is clearly Christian Kirk. This offense has gotten a little better since Mike McCoy got fired, but the improvements haven’t been to the level that a lot of people expected. @MB: thanks i could not make a decision. Would you play DJ Moore or Humphries over Golloday this week ?